Dewhurst Torevell has been a proud co-sponsor of The Share Race Challenge for the last two years, setting a real life brief for the teams and awarding a prize for the team with the Best Investment Discipline. Open to students from The University of Law, Manchester, the Share Race Challenge sets four teams of students a challenge to invest £100,000 of virtual cash into FTSE 100 companies on a dummy trading platform. Held over a five month period, the competition asked teams to invest the money for ‘virtual clients’ with specific investment objectives set by Dewhurst Torevell Director, Emma Holden. The case study was treated as a real life situation satisfying a number of differing client requirements and so was an ideal introduction to the financial sector. 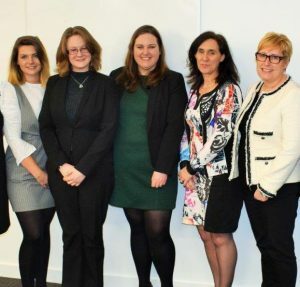 The teams were given expert guidance throughout the challenge by Emma Holden, Quilter Cheviot’s Investment Manager Helen Russell, and JMW Solicitors Equity Partner Richard Powell. All mentors provided the students with insight into financial markets, share values and the investment decision process. The Share Race Challenge culminated in a prize presentation in April at The University of Law where the most successful teams were recognised for their navigation of the financial markets and delivery of virtual client investment goals. Team Gamma, comprising Alex Streeter, Gareth Wood, Lloyd Barker, Nadia Abedin and Nelly Kubheka, took the prize for the Highest Portfolio Value. The prize for Best Investment Discipline sponsored by Dewhurst Torevell went to Team Beta, namely Anne Gascoigne, Christie Nelson and Robyn Asbury; with Alex Streeter taking the prize for outstanding student. All prize winners benefit from a trip to Chester races for the midsummer meeting on 1 July. Emma Holden commented: “Dewhurst Torevell is delighted to have supported the award for the Best Investment Discipline and congratulates Team Beta on their ingenuity and hard work. The Share Race Challenge is one example of Dewhurst Torevell’s engagement with Manchester’s students, and is seen as an excellent way of introducing students to the financial sector, as well as allowing them to develop broader presentational and communication skills necessary in the commercial world.